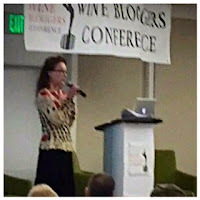 When I started blogging in 2010, I quickly became aware of an event called the Wine Blogger's Conference. Every year via social media, I watched my on-line cohorts discuss the benefits and fun of attending this yearly gathering. I toyed with registering and making the trip but other things kept taking precedence. As I met more people who had actually attended, I became a bit more determined to go and see what it was all about for myself. This month, I finally did just that, I arrived in the Finger Lakes region of New York on August 13 and it was game on. Upon getting off the plane, I was greeted by a representative of the region at a table loaded with wine just waiting to be tasted. 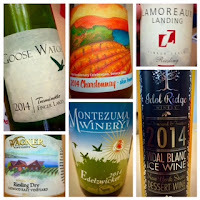 This was just the beginning of my immersion into #FLXWine. Later that evening, we enjoyed a sip and stroll style tasting with light bites from local restaurants served alongside the many diverse wine offerings from the area under a tent in a park in the Gaffer District. This casual evening event provided a great opportunity to officially meet some people that I had only previously spoken to on-line. The next day, the non-stop whirlwind of wine and information would continue. Karen McNeil, author of The Wine Bible, opened the conference. She shared her personal journey and her thoughts on everything from improving one's writing skills to being a better wine taster. 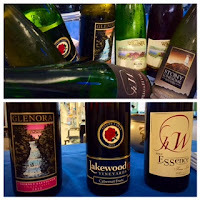 We then learned about the unique terroir of the Finger Lakes from Cornell professor, Alan Lasko, who started at the beginning with the prehistoric glacier movements that formed the lakes. The conference would continue with breakout sessions which attendees selected based on their personal interests from an array of topics. I opted for a Lambrusco class taught by Bill Whiting, Director of Wine Education for Banfi Vintners, I'll be writing more on that later. An alfresco lunch, along with an opportunity to taste more wines, would follow. Booths set up with some sparkling wines of Alsace and cool Verdejo wines from Rueda would lure me over to them on this warm afternoon. Back inside, we were ready for some live blogging. This is an intense speed dating type of event. 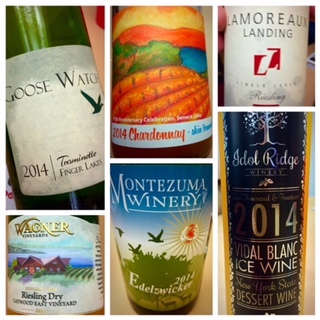 Ten winery representatives would take turns presenting their wine for a tasting at each table; conference attendees blogged or tweeted their initial thoughts on each as quickly as they could before the allotted time was up. After that, it was time to load up the buses and head out for our excursions into wine country. I enjoyed riding with Scott Osburn of Fox Run Vineyards. He not only crafts some fantastic wines, he is obviously loved by everyone in the community. Destinations were unknown as each bus left the Radisson in Corning; we soon arrived at Lakewood Vineyards on the Seneca Lake Wine Trail. I was so pleased to meet the Stamp family, every member seems to be involved with creating their fabulous line of wines. We took a hayride through the vineyards and, after another tasting of Finger Lakes wines, we dined outside with a lake view. I was pleased to sit with Judy and Len of Keuka Spring winery, I enjoyed tasting their wines and hearing their story and seeing photos of their beautiful property. This could have been the end to a very full day but it wasn't. That evening we were dropped off at the Rockwell Museum where we viewed collections of Native American art and western artifacts. I had the pleasure of taking in the sights with Aurelio Montes del Campo, flying winemaker extraordinaire from Montes and Kaiken. Lest you think we had stopped tasting, fear not, tables were set up to allow further sipping while viewing the museum exhibits. Back at the hotel, Jordan Winery hosted an after party for attendees who hadn't yet sampled enough. Guests could also find rogue parties happening throughout the area with further opportunities to taste and network. That was just the first full day of #WBC15. The next two days held even more educational opportunities, I attended a class with Aurelio Montes where I learned more about winemaking and the terroir in both Chile and Argentina while tasting some great wine. I also attended sessions on photography, wine writing and wine blogging. I participated in a second round of live blogging which allowed for another opportunity to get a taste of the Finger Lakes. 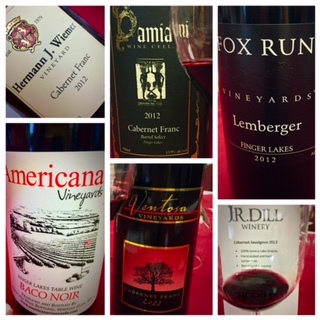 I am now unquestionably a fan of the Cabernet Franc, the Pinot Noir along with the many different white, sweet, sparkling and rosé wines I tried. The Saturday night dinner and award ceremony were held at the Corning Museum of Glass where we also enjoyed seeing a glass blowing demonstration. More parties were happening at the hotel and in the town of Corning after the evening's official events. 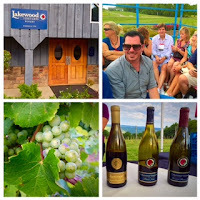 In addition to all that I've mentioned here, there were optional winery excursions both before and after the conference. These side trips provided a bit more for those with extra time. I didn't take part this year but I hope to do so the next time that I attend. Overall, my expectations about this conference were exceeded. I had a great time, I learned a lot, I met so many wonderful people and I got to personally connect with many others whom I had only known virtually. If you have ever considered going to the conference but haven't pulled the trigger on that decision, I highly recommend that you seriously make your plans for next year. It will be held in Lodi, CA, and expectations are high.